Last week I mentioned that the lawsuit (if you can call it that) filed against me, the President of the United States, and a number of other dignitaries by birther/dentist/lawyer Dr. Orly Taitz had been dismissed. I also mentioned having seen a chart purporting to list every court ruling in the many cases that have challenged Obama's claim to be a "natural born citizen," and based on that I suggested that Taitz's record in court on these cases was 0-158. I heard from the person who compiles that chart, who kindly gave me permission to link to it, and after reviewing it again I need to make a couple of corrections. First, it may not be correct to ascribe all these losses to Orly Taitz. Certainly there are other people involved in filing these things, including Keith Judd, who I mentioned here in a slightly different context, although a context that also involved him being in prison, and also Philip Berg, who I mentioned here. None of these people have ever won a single victory in their "birther" lawsuits, nor has anyone else, and it's also entirely possible that Taitz is involved in some or all of these other cases behind the scenes. But to be strictly accurate, while Taitz is zero-and-something, it may not be zero-and-158. Second, the overall record is significantly worse than I thought, according to the "Birther Scorecard." This chart, which is currently 70 pages long and lists 175 cases, includes short summaries and also links to almost all the cited orders, where they are available online. It's an impressive piece of work, created by Tesibria at What's Your Evidence? 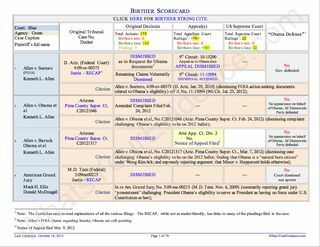 According to the Scorecard (last updated October 18), of the 175 cases she thinks can be fairly classified as "birther" cases, birthers have lost 166 and the remaining nine are still pending. If you add up all the individual rulings, including those in appellate courts and the U.S. Supreme Court, the birther's arguments have been rejected (or appeals denied) at least 258 times. As a bonus for me personally, I think I've also gotten at least one new entry for the Comical Case Names page from this, because one of these people apparently insists on filing cases as "Annamarie Last Name Uncertain." Not "Annamarie Doe" or something like that—as this court noted, "In her pleadings, Plaintiff indicates that her first name is Annamarie and that her last name is uncertain." But the captions actually read Annamarie Last Name Uncertain vs. [Whoever]. Nicely done, Ms. LNU. In general I support the rights of the uncertain, but nobody seems able to even figure out what this person wants.